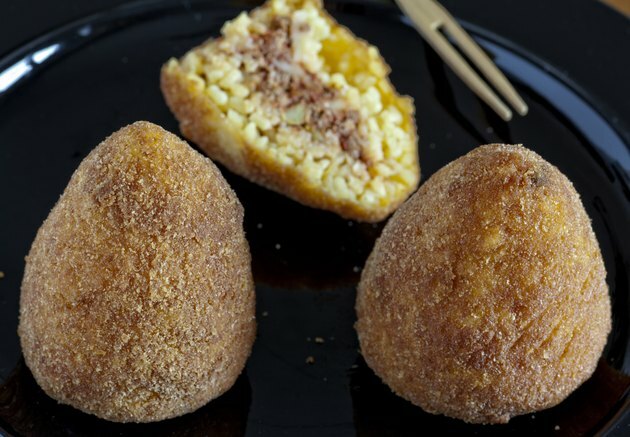 Arancini, or fried rice balls, are small, round balls of cheese coated with cooked rice and then deep-fried. Ricotta cheese is sometimes used for the filling, as are parmesan and reggiano. One form of arancini places meat in the center of the cheese filling. Their round shape and golden color give them their name, which means “little oranges.” Italian rice balls can be made ahead and frozen or purchased pre-cooked and frozen. It’s not difficult to reheat rice balls, and you don’t have to add fat by re-frying them to get them crisp. Place the rice ball on the oiled baking sheet. Bake the rice ball for 20 to 25 minutes if it is not frozen and for 40 to 45 minutes if it is. The rice ball is done when it is crisp on the outside, and cutting it open shows that the center is hot throughout. Serve arancini with marinara sauce for dipping. Do not microwave arancini because the filling can explode out through the rice crust if it gets too hot.